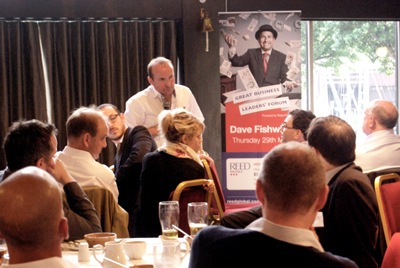 Pioneering entrepreneur and founder of ‘Bank of Dave,’ Dave Fishwick, dished out a generous serving of hearty business stories and advice to launch a series of Reed Finance Great Business Leaders’ forums at The Dickens Inn, St. Katherine Docks, London. Dozens of finance professionals packed into the venue on 29 May to fill up on Dave’s knowledge gathered from his journey to set up a local bank and become the largest supplier of minibuses in England. In-keeping with Dave’s down-to-earth persona attendees were treated to a pie and a pint. Dave shared the story of how he formed ‘Bank of Dave,’ as well as delivering topical conversations about community banks, which resulted in an energetic debate with knowledge, thoughts and opinions to be shared. Chris Harrington, senior area manager for Reed Finance London and host for the evening, says: “Dave was the perfect person to kick off the series of our Great Business Leaders’ forums. All of the finance professionals who attended gained valuable insight from the night as well as enjoying the opportunity to network and share ideas with fellow professionals.